A trend I have seen a lot of recently is creating surprise cakes where the cake makes a fun shape when it is cut. 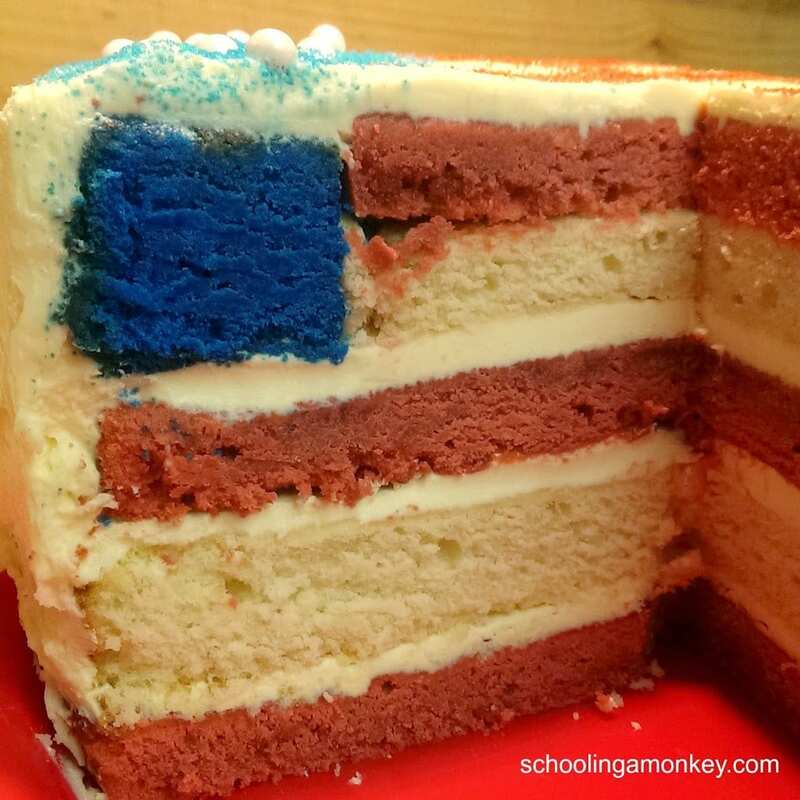 Since the 4thof July is coming up, Monkey and I decided to make our own version of the American flag surprise cake. The actual cake shaping itself is simple, but if you make your cake from scratch, expect to spend a full day or 2 half days making it. But the results are well worth it. This cake and icing recipe are so delicious! This cake uses a lot of rich ingredients, so you will only need to eat a little bit to feel full. 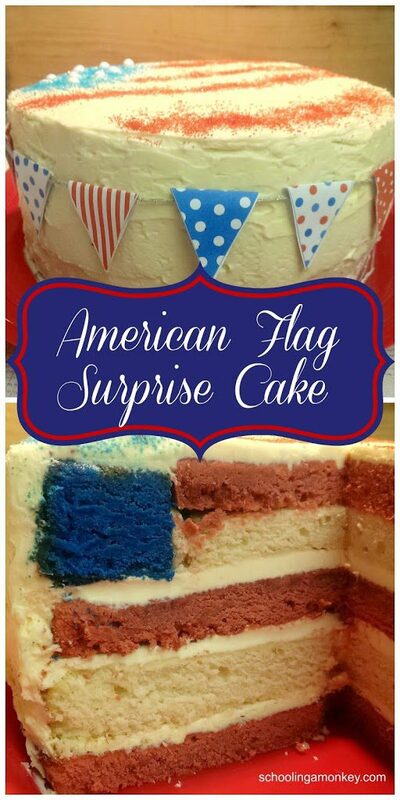 This would be the perfect cake to serve at a large 4th of July gathering with 20-30 people! I wanted to make this cake completely from scratch, so I used a modified version of the best white cake ever recipe from Add a Pinch. The only modifications I made were to completely eliminate the shortening, because I don’t believe in it. I used all butter. I also ended up using some powdered sugar instead of granulated because we ran out. 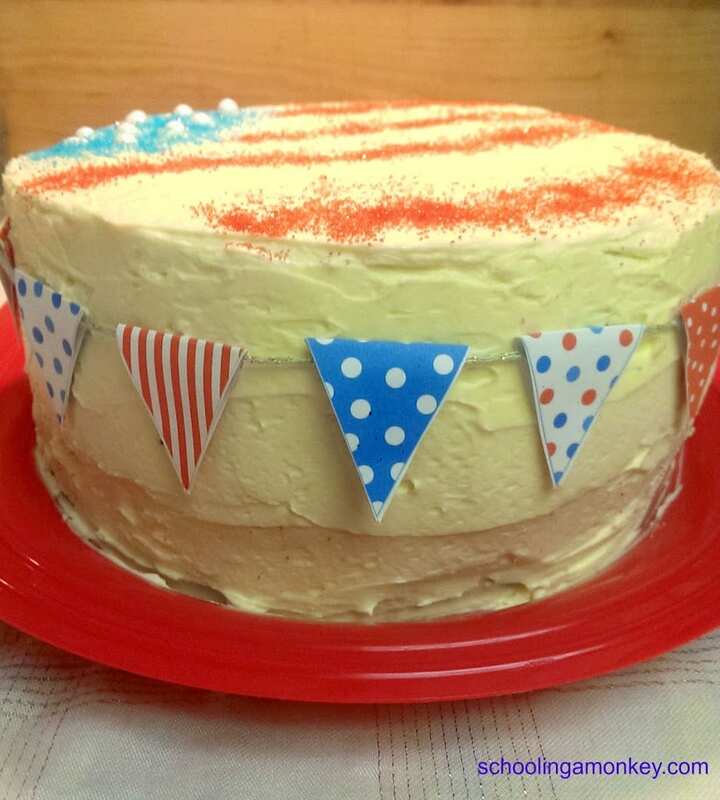 For the American flag surprise cake, I doubled the base recipe. 6 cups of batter in one bowl, dyed red. 4 cups of batter in one bowl, kept white. 4 cups of batter in one bowl, dyed blue. at first, to make this cake healthier, but the dye was not strong enough for such a large batch of batter. We found that using paste food coloring worked best. Cut out parchment paper circles to line the bottom of the cake pans. This helps prevent the cake from sticking to the pan. When creating thin layers, parchment paper helps to keep them intact when handling them so much. 3 red layers using 2 cups of batter per layer. 2 white layers using 2 cups of batter per layer. 1 blue layer using all 4 cups of batter. Cook the thin layers for about 20 minutes each at 350 and the thick blue layer for about 30-40 minutes at 325 degrees. Allow the cake to cool completely before removing from the pans. Stack the layers onto a freezer-safe plate using foil or parchment paper to separate the layers. Freeze the cake at least 2 hours before trying to cut the cake as outlined below. While the cakes freeze, you can make the German buttercream. I do not like typical frosting. I dislike the incredible sweetness and the vague powdered sugar taste. I’ve discovered that I love the texture and taste of German buttercream frosting. The only problem is, all the recipes I’ve found come with metric ingredients listed in grams and ounces. If you have a scale, this isn’t a problem, but I only have standard imperial measuring tools. Lucky for you, I’ve modified this amazing recipe for German buttercream frosting from Brave Tart for you so you can make it in America. 4 sticks of butter (if your butter is rich, you may be able to get away with 3 sticks). I’ve tried it both with unsalted and salted butter, and I am not sure which I prefer. The unsalted version is a little flatter in taste, but salted butter makes it taste more like butter. If you use salted butter, skip adding salt. Use a double boiler to heat the milk until it is simmering. Add the vanilla. While the milk is heating, mix the rest of the ingredients except for the butter. Set the butter on the counter to cool to room temperature. When the milk is hot, mix half of the milk into the egg mixture, then pour the egg mixture into the pan. Cook until the mixture thickens and starts to pop. It will have an oatmeal-like consistency. Cook for about 3 minutes after this point to remove the flour or cornstarch flavor. Stir constantly! After the custard is thickened, remove from heat and allow to cool to room temperature. You can speed up the process by sticking it in the refrigerator or freezer for 30 minutes or so. Do not continue if the custard is hot or you will melt the butter. If you do melt the butter, the frosting is not ruined. You can just cool it down for 20-30 minutes in the refrigerator to harden the butter slightly. Add the butter to the cooled custard mixture one small chunk at a time. Mix with an electric mixer until the consistency is thick and frosting-like. It will look closer to the texture of whipped mashed potatoes, rather than the glossy and somewhat pudding-like texture of store-bought frostings. Remove the frozen cake from the freezer. Make sure the red and white cakes are stacked in this order from bottom to top: Red, white, red, white, red. 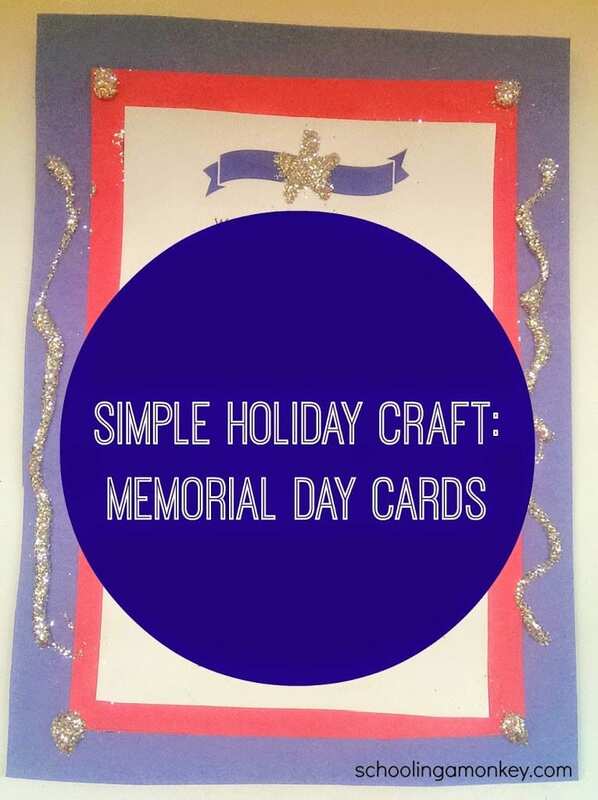 Cut a 6-inch circle from paper or cardstock. You may need to alter the size of the circle slightly to get the correct proportions on your flag. 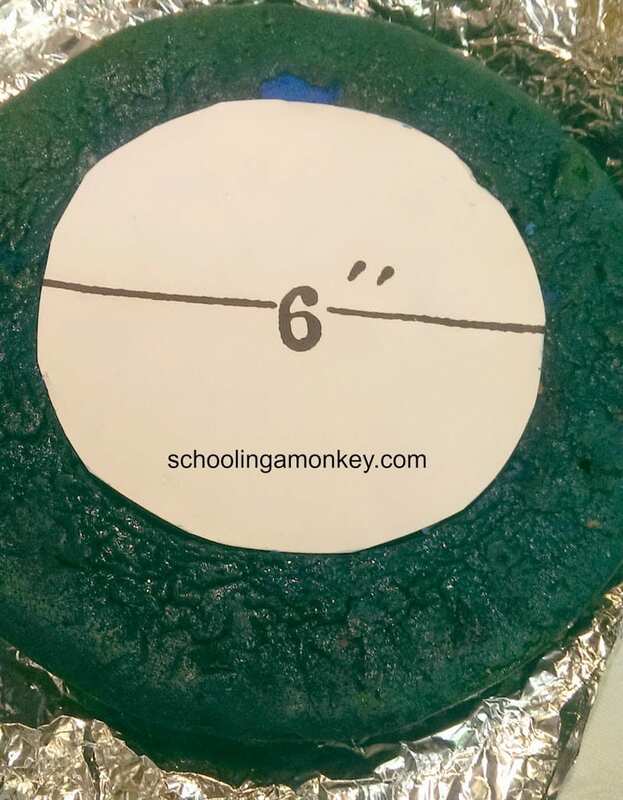 I think our circle may have ended up around the 5 ½ inch size for a 9-inch cake. 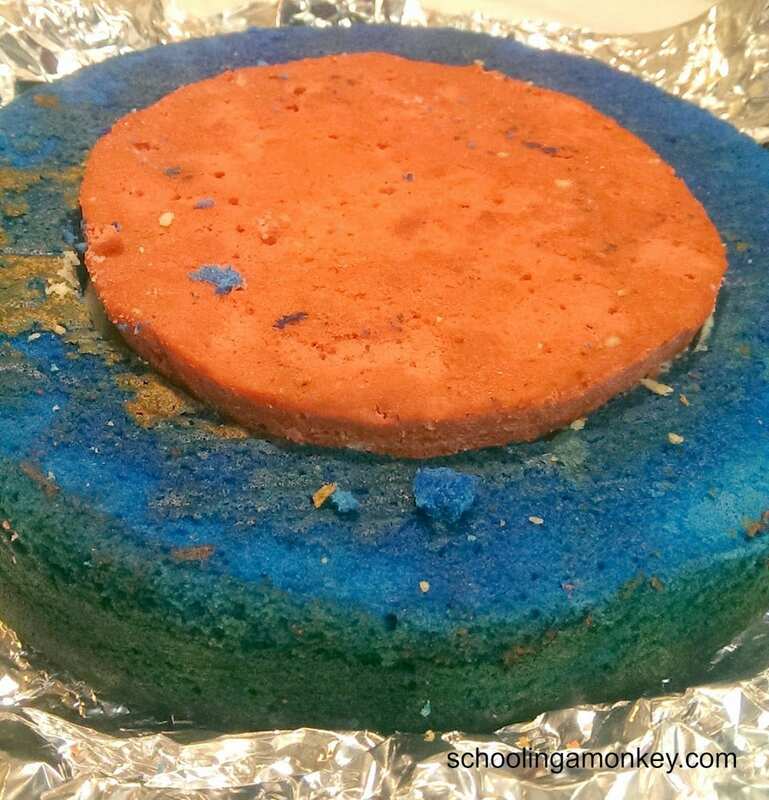 Place the circle in the center of the blue cake and cut out the center using a sharp knife. Carefully pop out the center piece without breaking the outside layer. You may have to flip the cake over and cut from the back to make the cake easier to pop out. Repeat the cutting process with one white and one red layer. This time, save the center pieces rather than the edge of the cake. Place the red layer and the white layer inside the blue circle, with the white layer on the bottom and the red layer on the top. Try to get the two interior layers to the same height as the blue layer. I ended up having to trim some of our white cake layer to make it the correct height. red circle lay flat with the top of the blue layer. Place the full red cake layer onto your serving plate. Spread a thin layer of frosting, then add the white layer. Repeat for the other red layer and then add the blue layer with the red and white center to the top. Spread a thin layer frosting onto the cake to seal the crumbs in with a crumb coat. Add a thicker top layer to make it look pretty. German buttercream spreads beautifully and if you want to pipe it, it holds its shape pretty well, as long as the butter doesn’t get warm. 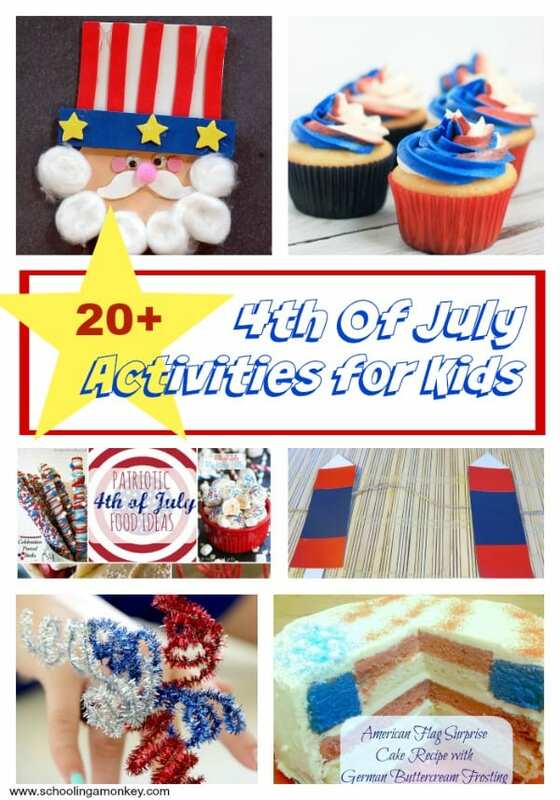 Decorate as desired, then cut into the cake and reveal your amazing flag! 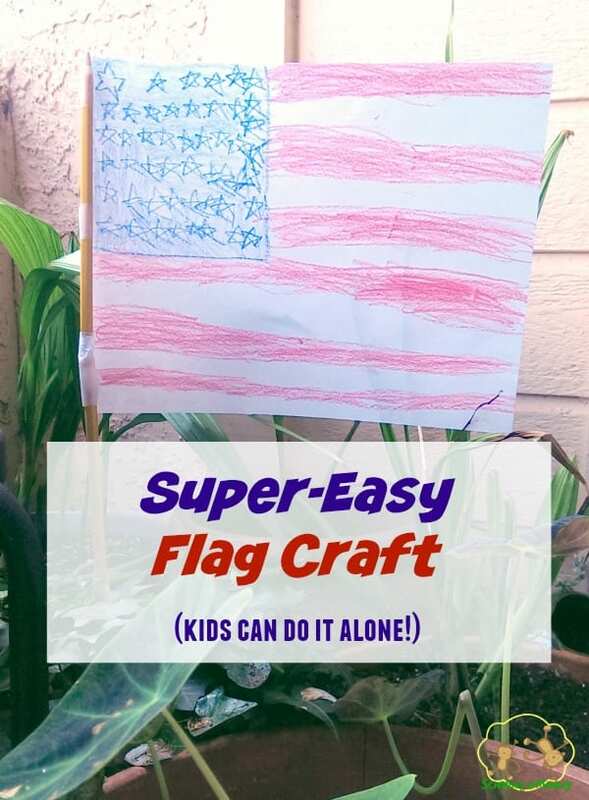 to make the stars on the flag. I also used the same cake bunting I used for Bo’s circus birthday cake to decorate the sides of the cake. If you don’t want to go through all the trouble of making a from-scratch cake, you can use boxed cake and frosting. You will need 2 box cakes and 2 tubs of frosting. Follow the dyeing and assembly instructions outlined above. This is probably the best white cake I have ever eaten. It is so good! However, it still has a white cake taste, which can get a little boring after a while. I think when I make it again, instead of using a vanilla frosting, I will add a little more flavor in the frosting, or use a combination of frosting and filling between the cake layers to add more dimension to the cake flavors. If you refrigerate this icing, either before putting it on the cake or after, it will be hard. You will want to allow the icing to come to room temperature before serving. This will also prevent the cake from being hard. 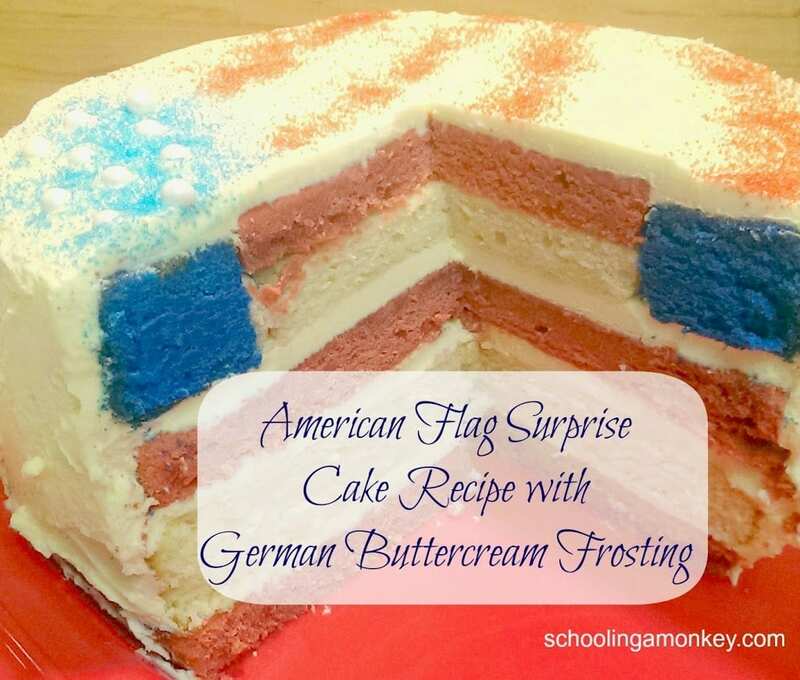 If you make this cake or German buttercream frosting, share your results with us on the Schooling a Monkey Facebook page or in the comments below! We would love to see them!